An outstanding contributor to the appreciation and study of early dance is honoured. At the Early Dance Circle Biennial Conference yesterday, Dr Madeleine Inglehearn received the Peggy Dixon Trophy from Darren Royston, EDC Chairman. 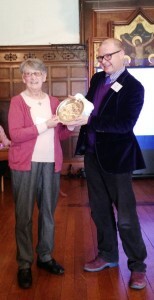 The EDC was proud to be able to recognise Madeleine’s lifetime of service to early dance. Now the President of the European Association of Dance Historians, Madeleine Inglehearn was for many years Professor of Dance History at the Guildhall School of Music and Drama, as well as Artistic Director of The Companie of Dancers. She has choreographed for stage and screen, advised on many projects, published widely and worked closely with educators.